Bored with sweet potato casserole and sweet potato pie? Try this sweet potato cake, a twist on traditional cake that features nutrient-rich sweet potatoes that is good for you. It's the perfect addition to holiday dessert tables. This sweet potato cake is made with mashed sweet potatoes, cinnamon, chopped walnuts, and brown sugar. Sweet potato cake recipe can be made into a pound cake or layer cake. You will see a lot of wows !!!.... when you serve this cake. There is a lot of sweet potatoes out there waiting to because a sweet potatoe cake this Sunday. Remember always try something new. 1 medium sweet potato, peeled, cubed, boiled, and mashed. Cream the butter and sugars in an electric mixer until light and fully combined. Add vanilla and eggs, one at a time, incorporating completely after each addition. Let egg and butter mixture blend until very light in color, about 4 minutes on medium/high speed. In a separate bowl add the flours, baking powder, and salt and whisk to combine. In a large measuring cup, measure the milk, add the mashed sweet potato and maple syrup and stir to combine. When the butter mixture is light and fluffy, add 1/3 of the flour mixture and mix well. Add 1/2 of the liquid ingredients and stir. Repeat with remaining flour mixture and liquid mixture, making sure to end with the dry ingredients. Make sure to scrape down the sides of the bowl when giving it a final mix. Pour the batter evenly between two 9 inch round cake pans that you've buttered and floured. Tap the pans lightly on the counter to remove any air bubbles and bake in a 350 degree oven for 40 to 50 minutes, or until a toothpick inserted in the center comes out clean. Cool cakes in their pans for 15 minutes, then turn out on to wire racks to cool completely. 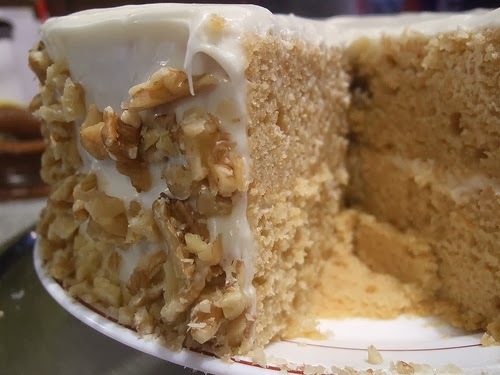 When cakes are completely cool, frost with Cream Cheese Frosting, and decorate the sides with chopped walnuts.